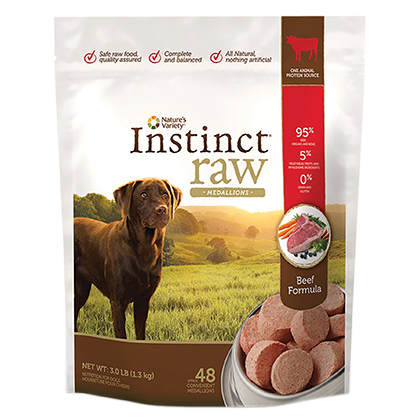 What is Instinct Raw Frozen Diet Beef? Instinct is a delicious line of raw food diets consisting of 95% meat, organ meat, and bones. The additional 5% includes vegetables, fruits, and other whole foods. This combination of quality meat and natural foods helps to provide nutrition similar to what your pet would eat in a natural habitat. 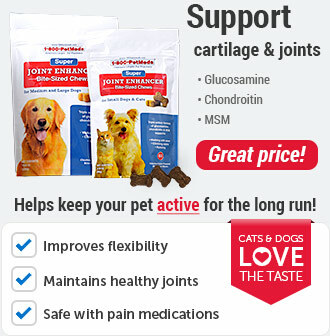 Instinct contains no grain or gluten, which makes this food a perfect choice for pets with food allergies. Instinct's Raw Diet formulas are also the first and only Raw Diet to be scientifically substantiated as complete and balanced by AAFCO's (Association Of American Feed Control Officials) Nutritional Protocol Feeding Trials. All ingredients in Instinct Raw Frozen Diet are sourced in the U.S.A. The Raw Food is made under the strictest quality and food safety standards, including High Pressure Pasteurization (HPP). Note: Instinct requires FedEx Priority Overnight ($19.99 on most orders). 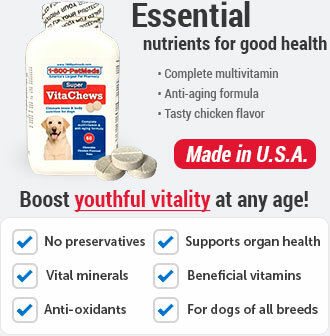 Complete and balanced for all life stages and all breeds. 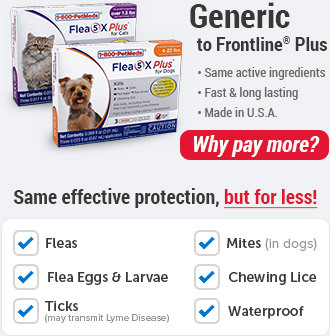 Recommended by veterinarians for pets with allergies. Convenient and ready to serve. 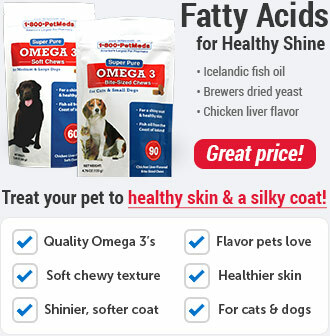 Helps normalize underweight or overweight pets. Decreases shedding, hot spots, and other skin issues. Smaller stools, less waste cleanup. Higher energy levels (No fillers or preservatives to cause lethargy). 1 year shelf life (freezer). 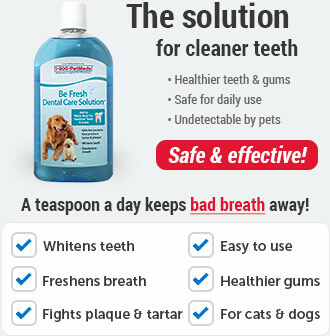 Feeding your pet Instinct Raw Diet replaces your pet's everyday kibble or canned food. The food is kept in the freezer and you only remove the portion of food you plan on feeding your pet. For morning feeding, take out the medallions the night before and for evening feeding, take the medallions out in the morning. Defrost your pet's daily portion by thawing it in a covered container in the refrigerator. Medallions take about 4-6 hours to defrost in the refrigerator. Serve cold when it is feeding time. There's no need to worry about feeding your pet a raw diet because Nature's Variety uses a process known as High Pressure Pasteurization (HPP) for safety. HPP kills pathogenic bacteria through high-pressure, water-based technology. This process applies uniform amounts of pressure eliminating food pathogens without losing vital nutrients or altering the food's freshness. HPP is a USDA-approved, 100% natural process, and is allowed for use on organic and natural products. Wash hands before and after handling raw diets to prevent contaminating the food. 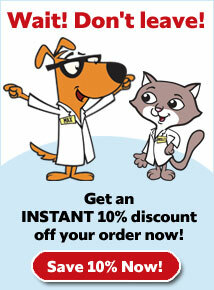 Instinct Raw Frozen Diet is not recommended for dogs with immune system problems or pancreatitis. Keep raw medallions frozen until ready to defrost. For morning meals, defrost the night before. For evening meals, defrost in the morning. Serve thawed medallions in your pet's stainless steel dish. Food should still be cold to the touch when served. Wash hands before and after handling raw diets to prevent contaminating the food. Keep frozen until ready to be defrosted for feeding. Instinct lasts up to one year in the freezer. Instinct's Raw Diet formulas are scientifically substantiated as complete and balanced by AAFCO's (Association Of American Feed Control Officials) Nutritional Protocol Feeding Trials.